Shrewsbury have made their 16th summer signing by recruiting Forest Green striker Andy Mangan on a one-year deal. The 27-year-old leaves Rovers by mutual consent, Shrewsbury having contributed to the settlement agreement. Mangan's move brings an end to his second spell at the New Lawn, which saw his contract terminated in February before he successfully appealed to have it reinstated in June. Rovers are now appealing against that decision to the Football Association. A statement on the Forest Green Rovers website read: "While the club wishes the 27-year-old well in his future endeavours, it maintains that there was a serious incident for which his contract was originally terminated in February. "Despite this action being overturned on appeal by the Football Conference in June, Forest Green are continuing with an appeal to the Football Association." 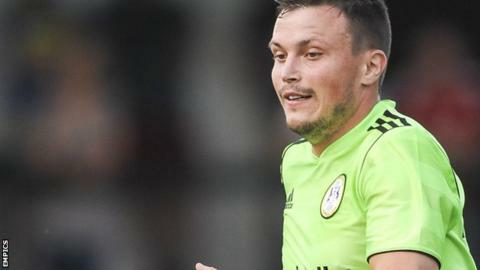 Mangan, who was just 12 months into a three-year deal, failed to score a goal in nine appearances last term, having netted 26 times in 46 games for the club in his first spell between 2008 and 2010 before joining Wrexham. The former Blackpool trainee also previously featured for Accrington Stanley, Bury and moved back to the New Lawn after two seasons with Fleetwood Town, where he played under Shrewsbury manager Micky Mellon. "I know what he will bring to the group on and off the pitch," Mellon told BBC Radio Shropshire. "He has got that instinct to get a goal. He can play anywhere across the front."